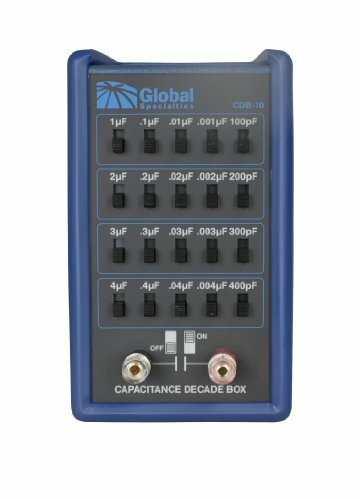 Model CDB-10 is a hand held Capacitance decade box that creates a specific capacitance value using a combination of switches. Designed with accuracy to meet the needs of industry and education alike. The CDB-10 is a compact, convenient tool for aiding in engineering design and testing as well as calibration of test equipment. It offers 5 decades of capacitance ranges, from 100 pF to over 11 microfarad in 100 pF steps. Easy-to-use slide switches allow for straightforward addition and subtraction of capacitor values. CDB-10 is a passive device that requires no power source. The unit is housed in a rugged handheld enclosure with an impact resistant rubber boot. Select capacitance in series or in parallel combinations. Calibrate test equipment with its high accuracy of 5 percent. 20 switches organized in a clean 4 by 5 grid for easy use. Includes a protective rubber holster with tilt-stand for ease of use and viewing. Set at any capacitance value from 100 pF to over 11 microfarad in 100 pF increments. Input terminals accept standard banana plugs, bare wires, spade lugs or alligator clips. Determine impedance, reactance and frequency characteristics. Vary capacitance levels in circuitry design, ie: oscillators, filters, timing circuits, impedance matches, rectifiers, and other RF circuits. Internal residual cap: 50 pF maximum. Voltage limit: 50 VDC (non-polarized capacitors). Connection: two (2) binding post. Accuracy: 5 percent (1 microfarad: 100 Hz test freq). Operating conditions temperature: 32 to 122 F. Humidity: < 80 percent RH.